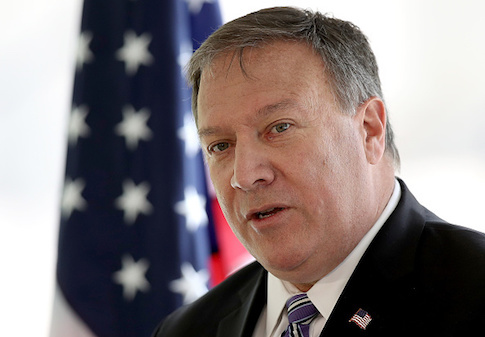 The CIA chief Sunday rejected Tehran’s accusations as he noted that the intelligence agency did not help the weeklong protests, which shook the Iranian regime. Mike Pompeo made the denial to Fox News as he chalked the protests up to Iran’s failure to address economic concerns of its people. “That’s what caused the people to take to the streets,” he said. He said Iran’s accusations are false. Iran’s prosecutor general, Mohammad Javad Montazeri last week accused the CIA of colliding with Israel’s Mossad and Saudi Arabia to work with exiled Iranian dissenters to stir protest in the Islamic Republic. “This was the Iranian people — started by them, created by them, continued by them, demanding a better set of living conditions and a break from the theocratic regime,” he said. Protests claiming better economic conditions late December in the city of Mashhad quickly spread across 80 cities in the form of regime change demonstrations. Over 20 people died as authorities strived to quash the anti-regime unrest, the biggest since 2009. Authorities cracked down on internet by banning Telegram messaging app and photo sharing app Instagram and arrested hundreds of people but the measures failed to curb the protests. They had to unleash powerful Revolutionary Guards to break the anti-government demonstrations. On Sunday, the Guards claimed they have suppressed the unrest. “Iran’s revolutionary people along with tens of thousands of Basij forces, police and the intelligence ministry have broken down the chain (of unrest),” the Guards said. Local residents in various cities told Reuters that the protests have lost momentum. Reports say the government has lifted the ban on Instagram but maintained the ban on Telegram. The CIA chief Pompeo however predicted that the unrest will continue. The violent unrest “is not behind us”, he noted. US President has been following the development in Iran and has given his support in a set of Tweets chided by French President Emmanuel Macron who also lambasted Israel and Saudi Arabia’s public stance on the crisis. Analysts believe Trump may use the unrest and authorities’ response to renew opposition to the 2015 nuclear deal signed between Iran and world powers. The US leader faces deadlines around mid-month on whether to renew temporary waivers or restore US sanctions on Iran, the Associated Press reports. In October Trump already refused to certify that Iran was in compliance with the accord that he deemed a “bad deal”. Written by: KanelkaTagba on January 8, 2018. Posted by KanelkaTagba on Jan 8 2018. Filed under Headlines, World News. You can follow any responses to this entry through the RSS 2.0. Both comments and pings are currently closed.